Jan – Feb – Mar is grape season – the perfect time to go on a day trip to a Vineyard in Bangalore. India boasts of two Wine growing areas – Bangalore & Nasik. 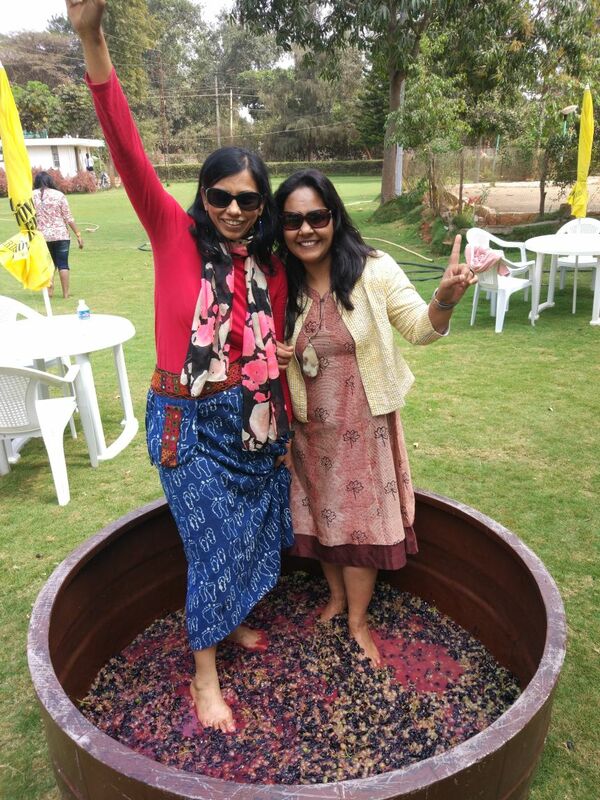 The Grover Zampa Winery in the outskirts of Bangalore near the Devanhalli airport is a nice day trip. We left Koramangla at 7.30 AM and reached our breakfast stop before 9 AM ( 52 Km). We had been here a year back – its located a few kms after the International Airport. The Indian Paratha Company is a great place for fresh piping hot Paratha’s, Chai, Lassi and a lot more. Service is excellent and food was delicious – but prices have shot up in the last one year (a plate of Sarson ki Saag and Makkai ki roti is now Rs 325). On a weekday the place was almost empty. The Grover Zampa Vineyard is only 17 Km from here – take a U Turn and after a few km take the right turn on the Doddaballapur main road and in less than 30 min you will reach the Grover Zampa Vineyard processing centre. This place has a vistor centre , the processing and bottling plants , and an outlet store. The tour starts at 10.30 AM and ends by 12.30. The guide takes you to the different sections and covers in detail all the steps of making all the varieties of Wine. You then head to the Wine tasting cellar where you are again educated on how to sample and enjoy Wine. You get to sample 5 different varieties of Wine. You can taste a few drops or you can get Tipsy with a glass full – its your choice. But clearly the Wine lovers love this part of the trip. We were fascinated with the storage Drums – which can be made to stools and table tops – and yes you can buy them in May – June when the crushing season is over since they change the drums once every two years. From here we headed to the Vinery – 1 Km away – a well maintained large Vineyard with an eye for detail to ensure that only the best quality grapes are grown. We were back for lunch at the main centre. We had booked for Grape stomping ( Min 10 people) – this is not like what it looks in the movies – the scale is smaller – but there is music playing , lovely weather and the Wine from the tasting session gets you in the mood to sway while crushing the grapes – fortunately this does not go back to the wine making drums. Lunch is a simple affair – Soup , Veg Pulao , Raita and Gulab Jamun. We were lucky we had a heavy breakfast – they could have done better with the lunch. A quick stopover at the store to get some discounted Wine and we headed back at 2 PM reaching home by 3.45 PM. The package costs you Rs 1590/ person inclusive of tax – the stomping is Rs 500 – its unique but expensive , 10 minutes of stomping for a group of 10 can put you back by Rs 5000/-.